My favorite vacation spot is Cape May, NJ. The combination of the sand, sun, sea air and surf re-energizes me.I love to swatch while relaxing at the beach or on the deck. Some of my best ideas happen there -- perhaps it is the ambience of the seashore, the fact that I'm more relaxed or that I have time to finesse ideas. The architecture of the Victorian houses and gardens provide inspiration for creating original stitch pattern combinations (textures, ribs & cables). I also love pattern stitch dictionaries with charts, taking components and re-configuring them. Try turning charts upside down for a new way of looking at stitches! I love to do cables, ribs, textures, and lace, usually working with a single color, sometimes a second color as an accent or edging. My favorite colorwork technique is slip stitch. As a yarn shop owner assisting knitters on a daily basis, it is clear that knitters come in all shapes & sizes. Each of us has a challenge of some sort with fit. I try to provide a wide range of sizes that can easily be adapted for length, generally 36" finished chest for a small frame to 52" - 56" for larger frames. The sizes are usually in 4" increments (36" - 40" - 44" , etc. ), but that is determined by the pattern stitch and gauge. 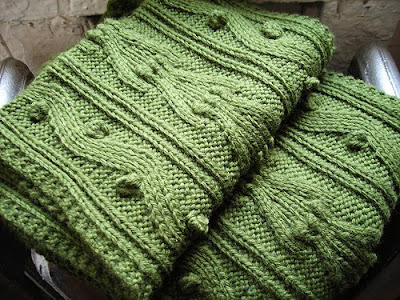 If the pattern repeat requires a large multiple of stitches, then less sizes are possible. I try to have extra "filler" space at the sides (reverse stockinette, seed, texture pattern with a small repeat multiple)to accommodate possibilities for a variety of sizes. I prefer to "do my own thing" and be as original as I possible can be. I tend to prefer classic, timeless styles rather than trendy as I find that my shop customers prefer this, and this is what I seem to do best. Sometimes, something in ready to wear in a magazine will catch my eye and, although that is a starting point to spark an idea, the resulting concept usually winds up quite different from the original inspiration piece. When doing freelance work, the editor generally provides a theme or general idea of what they are looking for in a particular magazine issue or pattern collection. I try to write patterns as clearly as possible. Most of my designs that are accepted for publications are intermediate level and beyond. Any "dumbing down" is usually done by the tech editor. My personal opinion is that knitters should be challenged to learn something new with each project, and "stretch" by skill-building. Clear directions with good illustrations may help the knitter's confidence level while "keeping it simple". I am blessed to have two sample knitters plus a couple of "shop gals" who help out periodically. There is no way I can do everything myself and I appreciate their support. They make me "look good" and provide an invaluable service in test knitting for accuracy. I wish I could say yes, but I'm very busy. I do have a schedule and notes of what needs done handwritten on a large legal pad and this old-fashioned way works best for me. Three, in fact. I learned about traditional fisherman knit cables from classes with Alice Starmore; about pattern presentation by test knitting for Michelle Rose Orne; and Kristin Nicholas guided me on my freelance designing career by introducing my work to major knitting editors and to the knitting public through Classic Elite Yarn collections. Not in the fashion field. My husband and father-in-law were most helpful to me in building my yarn shop business, which paved the way for my design career. The Internet has expanded communication throughout the knitting world. I have two "Kathy Zimmerman" groups on Ravelry -- one for my yarn shop "We Love Kathy's" and one for my designs, the "Kathy Zimmerman group". There are several "knit alongs" for my projects. Many of my designs from back issues of Interweave Knits and Interweave Press publications are now available from their on line stores, which helps to perpetuate popular designs, making them available to new knitters. I would say that the Internet had broadened the horizon. Not directly. My knitters test knit model garments, and check the pattern along the way. I provide copies of my worksheets to magazines and yarn companies along with my projects, for tech editing by their respective editors. It becomes increasingly difficult, as deadlines frequently tend to "clump" around trade show dates and new yarn availability.I make time for an early summer and late fall vacation with my husband and pet Siamese cat, usually at the beach. Most of my friends are knitters, and my relaxation and socializing involves meeting informally with them to knit. I think anyone who truly cares about their work is sensitive to criticism. It depends on whether the criticism is knitting-related or personal. If it is knitting-related and the criticism involves a problem with a pattern or an error, then I do my best to correct the problem on an individual basis. If the criticism becomes personal, mean-spirited, or hurtful, dealing with it becomes more challenging. You can only continue to do what you do best. If possible, concentrate on turning the negative into something positive. There are some people that will always be hard to please. I've been designing since 1986, owned a yarn shop since 1980. It takes designing commissions & royalties, yarn shop income, and teaching workshops (travel involved 3 - 4 times per year) to be able to support myself. It took about 10 years to start making a profit.